A Wide Range of Subjects on one Theme. 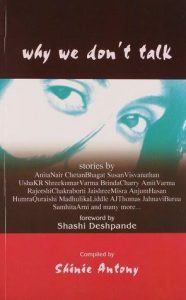 “Why we Don’t Talk” is an anthology of short stories edited by Shinie Antony. It consists of 27 pieces by different authors. Some of them are commented upon here. 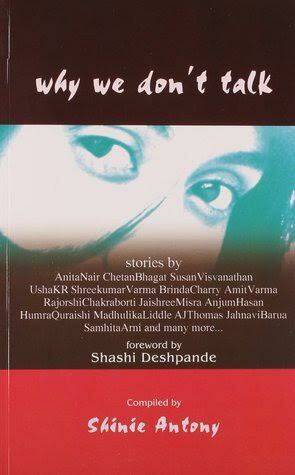 The collection has a Foreword by Shashi Deshpande touching on the nature and state of short fiction. Good Housekeeping Anjum Hasan Mother left by husband and daughter jilted by lover. Living together is difficult for them, but so is living apart. Sophisticated storytelling. Pepper Vines Entrails My Hair. Susan Viswanathan. It is predicted that a girl will die at 27 years. Her father marries her off to his friend, she bears children, but the prediction makes her a prisoner of destiny. A lyrical moving tale. The Cut off. Chetan Bhagat. About a youngster, disappointed at the competition for a seat in the right colleges, feels pressured by the family’s expectations, decides to commit suicide. Father’s timely solution saves the situation. Readable. Fairytale. Malavika Velayanikkal A short tale and that is such a blessing. One Night’s Work. Madhulika Liddle. Set in Old Delhi, Told from the point of view of a woman who is sold to a jeweler for a night. A twist in the tail ending. Sweet and Sour. Jahnavi Barua. The power play among men and women in a domestic situation. Plot-less but beautifully told. A pair of bangles. Jaishree Misra. Ancestral jewelry, the cause of family feuds, goes missing. After the lapse of years, a representative girl of an earlier generation, visits from America. All are pleased and warm up to her. But she rakes up the old issue ! Funny story. Why We don’t talk. Shinie Antony. A haunting tale, written in the author’s trademark style – crisp, dry and witty. The Middle Path. Srinath Porur. A madman with a peculiar twist rules the street. When it becomes unbearable people act. His disappearance becomes a matter of dispute. A bit philosophical. Fog. Vandana Chatterjee. A couple move from ramshackle area to a posh locality. The woman is lonely with a maid providing the only company. Rats trouble her. As does viral fever. The husband is interested only in suits and nightly excitement. Her spirits sink. Suicidal thoughts assail her. Done? No? Vague and attractive. Who Decides? Humra Quraishi. The Muslim couple who have escaped the communal clashes in Ayodhya find themselves at the outskirts of Ahmedabad. There too they struggle to hide their identity. The man is all nerves and the woman follows suit. No holds-barred writing. Painful reading. Provocative too. Urban Planning. Amit Verma. Satire of municipal administration. Amusing. The Night Man. Srikumar Verma. A Bose-supporter who believed in violence turns a peace-maker in old age. A Naxalite bent upon local justice seeks refuge. He obliges with two minds, also harking back to old times. But the visitor turns out to be a thief! Well-told. VVIP. Brinda Chari A Story about a powerful politician and his passive wife. He is same to her but commits things outside. What she hears stuns her. And when she transgresses, the collaborator is bumped off! Powerful story. Nicotine. Pramada Menon. A woman swings between men and women! Boredom in-between. Sophisticated. General comment. Male writers are generally objective and behavioral whereas the females are subjective and psychological. U. Subramaniam is the author of over half a dozen collection of short stories.